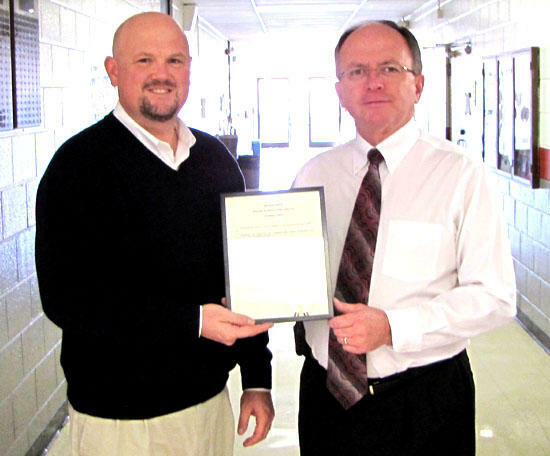 Westside Elementary School principal Robert Sain, left, accepts a plaque from Cannon County Executive Mike Gannon Friday honoring the late Annie Cox, a long-time teacher in the county. WHEREAS, Ms. Annie Cox attended games and supported youth sports and coached basketball at Westside Elementary School for many years. NOW, THEREFORE, BE IT RESOLVED BY THE Board of Commissioners of Cannon County, meeting in regular session on this 18th Day of July, 2009, that we honor the memory of Ms. Annie Cox for her remarkable service to her beloved County, her enormous contribution to the Children of Cannon County and her kindness and commitment to the citizens of Cannon County.